Available in eye poppingly luscious colors, the stylish Fitbit Flex is more of a life companion than an activity tracker. Slim, comfortable and easy to wear, Flex is a must-buy wearable fitness technology gadget. Wearable gadgets are getting more popular among the masses and the Fitbit Flex is one of the best in the market. With a slim and highly attractive wrist band with a sleek led display on top, the Fitbit flex takes the shape and function of a next-generation smartwatch. Once mounted on your wrist it tracks your steps, the distance that you cover each day, the calories that you burn and the number of ‘active minutes’ that you spend during each 24-hour window. Thats all achieved during the day, with the Flex having a range of functions to help you at night. So during the night it monitors how long and how well you sleep and even wakes you with a silent wake alarm thats designed to ensure a pleasant awaking as opposed to the abrupt nature of the dreaded morning alarm call. The LED display on top shows your progress, how your day is stacking up against your set goals and at the end of the day it automatically syncs your stats to your mobile device (free app available on Android and iOS) or your computer. The Fitbit Flex is NFC enabled and can sync directly to selected iOS and Android devices. IOS: iPhone 4S, iPhone 5, 5S, 5C, iPod Touch (5th gen.), iPad 3, iPad 4, iPad mini. Android: Samsung Galaxy Note 10.1, Samsung Galaxy Note II, Samsung Galaxy S III, Samsung Galaxy S4. It’s slim and really easy to wear with both large and small wristbands included in the box. Devices like this are intended to morph into your very being, and therefore to be worn continuously. It’s therefore no major surprise to find that this activity tracker is fully waterproof, allowing you to utilise it whilst bathing or whilst swimming. The Fitbit Flex comes with a Flex Tracker, Large and Small Bands, Charging Cable, Wireless Sync Dongle, and a Free Fitbit Account to record and analyze your progress. The Flex tracker is flexible and can be put into any of the colorful bands according to your mood, which come in a variety of tantalizing colors. 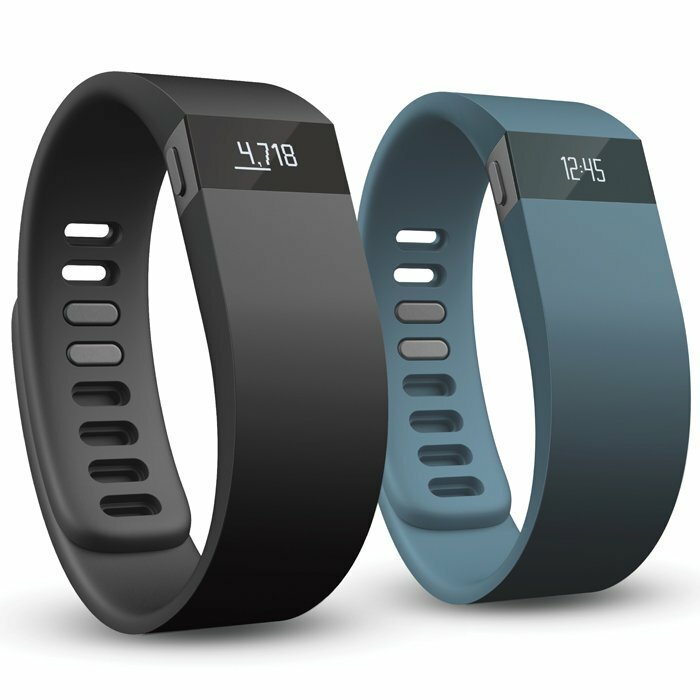 There’s no doubt that Fitbit have followed the fitness technology bandwagon with the colour scheme – there’s little attempt at quietly sitting on your wrist with these designs, with the band being used to really grab the attention of everyone around you. But what makes the Fitbit Flex standout? This is all well and good, but thus far, we have been seeing some fairly standard activity tracker features – so what makes the Fitbit tracker standout? The first feature that we really liked was their innovative 5 bar LED system. Fitbit uses a really simple and intuitive five white LED indicator system to show your progress throughout the day. Each light represents 20% of your goal. You just have to tap the display two times to view your progress against your set daily goals, which makes the lights more of a scoreboard. Complex feature? no, not at all, but its simple and easy to comprehend, and for us at BurnTech.TV – a website specialising in fitness technology – we really think that simple is good in this space. These are not complex devices, nor are they boasting tremendous levels of really sophisticated tech. They’re intended to simply help you to be a little bit more active throughout the day, and that’s not rocket science. Therefore, the 5 bar LED indicator really nails it in our opinion. The sensor used by Fitbit is the MEMS 3-axis accelerometer. We don;t expect you to know anything about that – that’s our job – and we won;t bore you with the details, except to say that this is amongst the best in its class tech. It notes your motion patterns to determine your calories burned, distance traveled, steps taken and also measures your sleep quality. Flex also contains a vibration motor, which allows it to vibrate when alarms are set to go off. Using the “Syncing Flex™” you can sync wirelessly and automatically with a wide range of leading iOS and Android Smartphones. Also the Fitbit Mobile app is available for free on iOS and Android devices for logging data, receiving notifications, and viewing graphs and charts based on your last sync. Flex also syncs with popular fitness apps for an integrated fitness regiment. Apps include Sparkpeople, LoseIt, MyFitnessPal, MapMyFitness, Runkeeper, and Endomondo. You can also share your stats from the device with friends and family and challenge them to beat health records set by you. Flex never has to leave your side and being waterproof, it accompanies you for a shower or swim too. The comfortable elastomeric wristband is not irritating during sleep and it will even track how long and how well you sleep and analyze your patterns. Silent Wake technology wakes you with a gentle buzz at a desired time without a sound or disturbing anyone around you. The tracker battery gives a backup for about for 5 days and to charge it, you only have to remove the tracker from the wrist band and place it in the charger until all the 5 led lights get solid. We were really impressed by the technology. The concept of it all is exceptional; tracking your activities and seeing your progress over time. However the tracker must be placed on the wrist. If you take off the tracker and put it into your pocket everything would go to waste as Fitbit’s calibration and algorithms are designed specifically for wrist placement. Nonetheless, while being sleekly mounted on your wrist, the Fitbit Flex can do wonders and help you maintain a healthy lifestyle. Our final thoughts? On the whole, we’re really positive about this fitness bands. We like the simplicity of its feedback system, yet acknowledge that it doesn;t provide the wealth of stats that some of its rivals do. Therefore, if you’re a real ‘stat fan’ you may find this to be a limitation. We found the strap to be really comfortable, yet found the design to be slightly lacking. Yes its clean, with clean lines and simple design philosophies, but we personally found it lacking the extra 10% which would have made it really standout – and standout for reasons other than the extensive and very vibrant colours that it sports. A final drawback is the lack of support for Android devices, meaning that a fairly large chunk of users will be effectively blocked from benefiting from this device. This is a problem shared with the Nike Fuelband, where Nike refused to offer Android support. All of that said though, we rank this as a solid 4 out of 5 tracker.